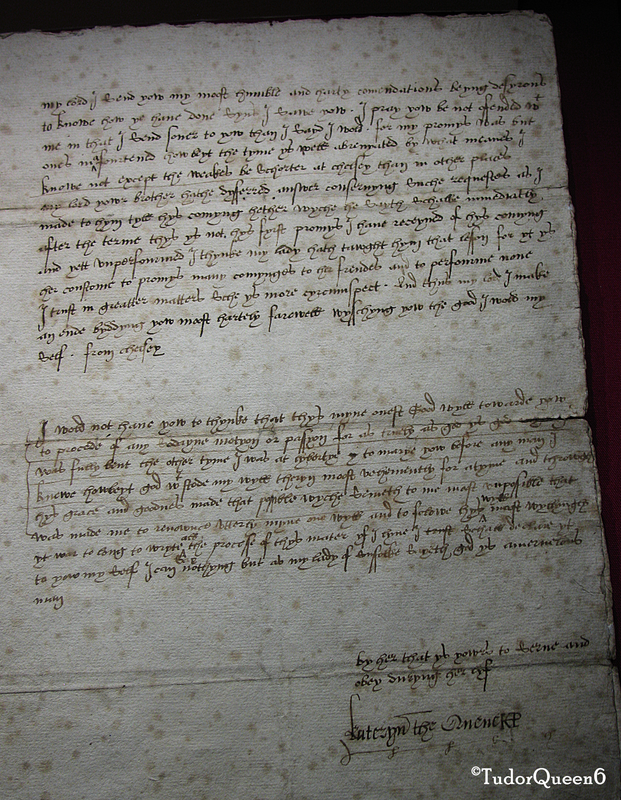 The actual letter from Katherine to Seymour as shown at Sudeley Castle, c. February 1547. [postscript] I wold not haue yow to thynke that thys myne onest God Wyll towarde yow to procede of any sodayne motyon or passyon for as truly as god ys god my mynd was fully bent the other tyme I was at lybertye to marye yow [which clearly shows she was at the time free to marry again] before any man I knewe howbeyt god withsode my wyll theryn moost vehemently for atyme and through hys grace and goodnes made that possible wyche semeth to me moost vnpossible that was made me to renownce utterly myne one wyll, and to folowe hys wyll most wyllyngly yt wer to long to wryte [all] the processe of thys mater yf I lyue I trust schall declare yt to yow my self I can [say] nothyng but as my lady of suffolke saith god ys amervelous man. My Lord I send you my most humble and hearty commendations, being desirous know how ye have done since I saw you. I pray you be not offended with me in that I send sooner to you than I said I would. For my promise was but such one once in a fortnight. Howbeit the time is well abbreviated: by what means I know not, except the weeks be shorter at Chelsea than in other places. My Lord your brother hath deferred answer concerning such requests as I made to him till his coming hither, which he saith shall immediately after the term. This is not his first promise I have received of his coming, and yet unperformed. I think my Lady hath taught him that lesson, for it is her custom to promise many comings to her friends, and to perform none. I trust in greater matters she is more circumspect. And thus, my Lord, I make an end, bidding you most heartily farewell, wishing you the good I would myself. From Chelsea. This letter was written as Dowager Queen according to Janel Mueller’s compilation of Katherine Parr’s works. The letters started in mid-February of 1547, AFTER the death of King Henry VIII. This particular letter was written in mid-February 1547 and is featured at Sudeley Castle.A recent publication in a British newspaper put forth letters discovered between Queen Catherine and Lord Seymour. The paper was unsure as to when letters were exchanged between the two. The letters, which reveal a different side of the queen, are compiled and preserved in the 2011 compilation “Katherine Parr: Complete Works & Correspondences” by Janel Mueller. According to Mueller, the letters started mid-February, 1547, AFTER the death of King Henry. As Dowager Queen, Katherine was free to express her true feelings towards Seymour. Her feelings about herself as a woman were also revealed within her book “Lamentations of a Sinner” which was published after Henry’s death. Katherine Parr (Author), Janel Mueller (Editor). Katherine Parr: Complete Works & Correspondences, University of Chicago Press, Jun 30, 2011. pg 129-31.